This section of the Cherokee Financial web site is still being developed. When complete, this page will contain a list of the questions we are most often asked, and the corresponding answers. 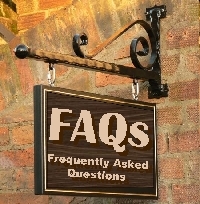 This is commonly known as the "FAQ" Page. When you create a debt, it is your moral and legal responsibility to honor your obligation. Even if your credit was damaged by previous inability to pay, Cherokee Financial will report your repayment to the major credit bureaus. Besides rebuilding your credit, Cherokee will help you take control of your finances. Cherokee cannot provide you legal advice. As part of the collection process, Cherokee may utilize a nationwide network of attorneys to litigate those accounts who have the ability but not the intent to pay. Please contact us before the legal process starts so that we may be as flexible as possible in arranging for resolution of your account. Our staff is trained to work with you and find a solution to help get you out of debt. However, if you absolutely refuse to contact us directly, perhaps you will choose to contact a consumer credit counseling organization listed below. These are not-for-profit organizations whose sole purpose is to help you get on track with your finances. To have your questions answered immediately, please contact us by telephone at (800) 543-0201. Thank you for visiting the Cherokee web site.